Iran's Minister of Communications and Information Technology Mohammad Javad Azari Jahromi has called for establishment of strong regional organizations to face the US sanctions during his speech at the Caspian Innovation Conference in Baku. "Establishing regional organizations and developing cooperation with neighbors are the solution to the sanctions," he said, Trend reports citing IRNA. 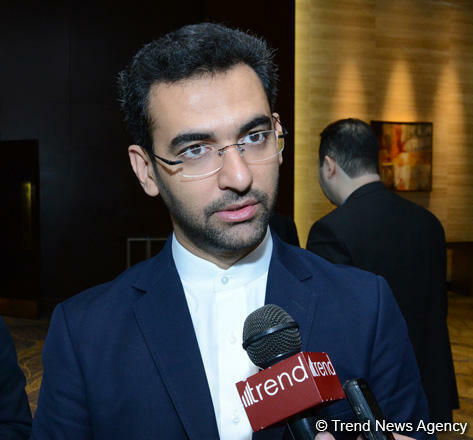 The Iranian IT minister attended the Caspian Innovation Conference alongside his counterparts from Azerbaijan, Turkey, Russia, Belarus, Lithuania, Afghanistan and 14 other countries. "We should follow our path to establish regional organizations to face the US unilateral challenge in the region, especially in IT," he said. "The world is entering a new revolution, the fourth industrial revolution or digital transformation," he added. "Iran has had a successful path in digital transformation and young Iranians have done big moves in developing IT," he said. "We are ready to share our experience in digital transformation with other countries," he said. Caspian Innovation Conference is an annual feature event of the BakuTel International Exhibition and covers different themes, such as Broadband Connectivity, Artificial Intelligence, the Internet of Things (IoT), E-Services Delivery, ICT-based Startups and Innovative SMEs, the Fourth Industrial Revolution and Knowledge-based Manufacturing, Cyber-security Readiness, etc.